At $2.6 billion, the Ohio River Bridges project in Louisville, Kentucky, is the costliest in the state’s history. It includes 18 elevated lanes, two enormously expensive bridges, a mammoth raised interchange, and a $225 million tunnel under an undeveloped suburban property (“Indiana’s Big Dig“). For years, Louisville residents J.C. Stites and Tyler Allen fought for a more humane, down-to-earth solution. Their plan — 8664 (short for “Remove I-64”) — proposed tearing down the elevated portion of the highway that stands between downtown Louisville and the Ohio River waterfront, to help integrate this mega-project into its surroundings. But it seems their fight may be over. For a while it seemed Stites and Allen were getting somewhere. More than 11,000 people signaled support for the pair’s highway-to-boulevard proposal at 8664.org. (This short video illustrates their proposed alternative.) Though the pair built a large grassroots organization to back the highway teardown plan, enthusiasm for the 8664 project never translated to political muscle. “They crushed us,” Allen says. This week, on short notice, state lawmakers approved $753 million in bonding for the Ohio River Bridges project, which they hope to fund partly with tolls. The bonds were rated BBB, just barely investment grade. The project also expects to receive a $452 million federal TIFIA loan, according to Business First in Louisville. Ultimately the fight to tear down and re-imagine the waterfront portion of I-64 fell victim to a political hornets nest surrounding the construction of the East End bridge. The 8664 plan hinged on the idea that this bridge would be built, but wealthy, suburban property owners in Jefferson County bitterly opposed it. These property owners unsuccessfully tried to use historic preservation to stop the bridge project, eventually obtaining landmark status for the 55-acre Drumanard property based on the fact that Frederick Law Olmsted, the father of landscape architecture, was once commissioned to plan the garden. But even these well-connected property owners couldn’t beat the Ohio River Bridges plan. Both bridges will be built. The most notable concession East End Bridge opponents won was the construction of a $225 million “tunnel under the trees” that would leave the Drumanard property untouched. Allen and Stites say they underestimated how committed their opponents were to the bridge plan, and how many political allies they had. Stites and Allen fought almost 10 years for 8664. The bridge project briefly stalled a few years ago, when officials didn’t know where the $2.6 billion would come from. For a moment, it seemed like a turning point. But things got moving quickly two years ago, once a plan was introduced to fund the bridges with tolls. The introduction of private funds also reduced the influence of citizens who opposed the project, Stites and Allen say. The construction of the Ohio River Bridges project means some of Louisville’s up-and-coming urban neighborhoods like NuLu — featured in New York Times coverage of the project — will be separated by an enormous concrete barrier. The interchange portion of the project, joining three highways, is particularly massive. It was reduced from an original width of 23 lanes to 18 because of funding issues. But even at 18 lanes, it will be a 325-foot wide expanse, slicing through downtown neighborhoods. Allen and Stites say they were in a difficult position from the outset, without any prominent political supporters. Unfortunately, that never changed. Hideous, costly in more than just monetary terms, and totally against the habits of post generation x citizens. You’ll regret this in 20 years. Looks like a piece of Florida or Texas will be right in Louisville. I’m shaking my head in disbelief that they’re going to spend $2.6 billion building that clusterf*ck in 2013. If I didn’t know any better I would think I was looking at GM’s Futurama exhibit at the 1939 World’s Fair. It’s like we haven’t learned a thing since then. Incidentally, the tunnel is the sanest part of this plan. If we’re going to bother having grade separated highways, then stick them all underground, at least where they travel through populated areas. And charge tolls which recoup the cost of burying them. Well, what can the rest of the county expect from Kentucky but an expensive, public/private partnership of a clisterf@#k? After all, they sent that a$$ Mitch McConnell to Washington just to screw things up. I was goin to attend a convention in Louisville in a few weeks but I think I go skiing in Colorado instead. Shoot, Mike, many of us regret that it’s being done already! Wow. A scathing criticism of government engineering and urban traffic impacts written by a “reporter-turned planner/advocate.” Not a bit of bias there, is there? 8664 was pretty pictures and a bad idea. Remove 8 miles of U.S. interstate anywhere in the country and tell me how that doesn’t cause the cluster your other commentors seem to think a scientifically proven solution is going to cause. Should Louisville have insisted on I-64 running somewhere other than the riverfront? Yes. In 1950. But they didn’t. Get over it. 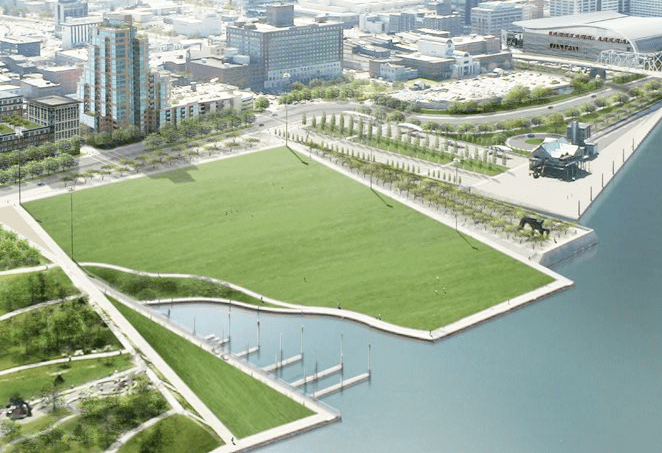 Last I checked the ORBP turns over 15 acres of land to Waterfront Park and raises the interstate over the South portion enough to make it an improved experience. Not perfect – but improved. But Tyler and J.C. aren’t going to tell you that. It’s not bleeding heart enough for your wonderful, unbiased blog. “They crushed us.” If by “they” Tyler meant logic, reason and rational city planning, why yes. They did. Louisville’s actually awesome, despite the bridge project and Mitch the B@&%$. It’s a shame that they won’t listen to the younger generations who have to live with this mess the longest. All it’s going to do is create a traffic nightmare. It’s called “induced traffic” and these bridges are just more stale ideas from older generations who won’t listen. An east end bridge might be a good idea, but we don’t need anymore downtown bridges. Louisville isn’t a downtown city. Put the money into the neighborhoods. Not saying I agree with ‘The Bridges’ project, but this blog pits is missing huge parts of the story… There was never a chance that the efforts of 8664 people were going to stop this thing that’s been in the works for 50 years . I wonder how many of the people who have commented on this story actually have to drive over one of these bridges to get to work and back like I do? Actually, speaking as a professional planner, these kinds of projects are anachronistic, and are being removed in other more progressive cities like San Francisco and NYC, or done completely different in places like Boston. 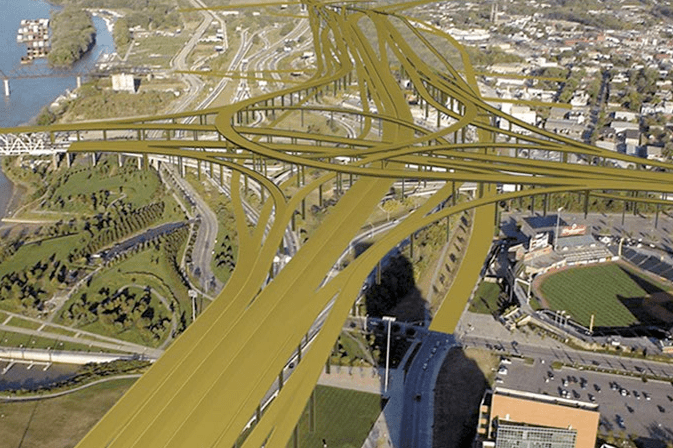 If you really care about the budget–federal, state, local–there are great alternatives to spaghetti junctions like this. Louisville will rue the day they built this, I promise you. No, this is without question a very willful and expensive error. I don’t care how “bad” you think your commute IN LOUISVILLE is, you are simply mistaken in thinking it justifies this level of expenditure – not only the $2.6B for the initial construction but the tens of millions annually – in perpetuity – it will cost simply to maintain. No. so it’s only bad because it’s expensive? I65 is a major highway that runs from Chicago to Mobile, Alabama, which is not only a major route for many semis and the bridge in the middle of this junture. I’m not saying it’s ideal, but I think it’s funny how everyone that has an opinion on this article more than likely does not, if ever, drive in this city. Last fall our only other main bridge (Sherman Minton) was shut down for 6 months which caused issues for businesses, people like me who work and drive through rush hour daily (tripling our commutes) because this route was the ONLY way anyone could drive across the river. The closed bridge that I usually take is about 20 miles west of this. We need to do something that will improve the flow of traffic, not make it worse. Not the only reason, and please don’t think I’m opposed to replacing bridges when replacement is needed. What I’m referring to is the whole package – a $2.6B project for a bridge plus multiple flyover and highway replacement arrangement to service a relatively limited number of people – strategic though the route might be. The price of keeping traffic “flowing” is too high in this case; especially for the amount of actual traffic it will likely service. think what you want bro, it’s happening whether anyone on here likes it or not. Oooh, shut me down. Hope it saves your hellishly onerous commute the 4 minutes a day it promises to when finished in 2023. The downtown Interstate Bridge is, at its heart, merely an addition of lanes to an Interstate. Traffic engineers will tell you that that does not relieve congestion as intended. What would have relieved some congestion is if the THROUGH TRAFFIC was routed around the city to the EEB. With vision, and money, parts of 8664 could still be implemented in the future. I-64 could still be designated I-164 and terminate – only it would terminate near Frankfort and become a street level boulevard there – and stay a street level boulevard through to 22nd street. That would allow a lot of the 8664 vision, especially connecting downtown and east Portland back to the river. I was confused myself when I saw the plans for the Ohio River bridges project and that not only an EEB but another downtown bridge. However, the Kennedy is in bad shape, and at some point it will have to be at least partially shut down if not completely for repairs, and the other bridges currently don’t have the infrastructure to support local and through traffic, in my opinion. What’s sadly ironic about it from a local perspective, and as someone (like Brooke) who lives in New Albany on the Indiana side, is that while the new bridges (might) make the commute to Louisville marginally faster, the tolls implemented to build the bridges will prevent Louisvillians from coming to Southern Indiana. Every Southern Indiana oligarch supporting this project knows that while it might fluff a handful of big businesses, it will wreak havoc on small, indie business — and they didn’t care, because they were able to harness commuter sentiment to push along their aims. It’s been sick, and it will have ramifications far beyond ephemeral time-saving. In these parts, apologists for Greater Louisville Inc and One Southern Indiana generally lack credibility. Just saying. Read the 8664 plan. Those “8 miles of U.S. interstate” are easily — and should be — bypassed by through traffic. With an EEB built, there is no compelling reason — no “logic,” as you say — to keeping and expanding elevated I-64 along the riverfront. Funny how this article doesn’t mention Tyler Allen’s disastrous mayoral “campaign,” nor how he stupidly threw his support to Republican candidate Hal Heiner once he lost in the Dem. primary. I’m not sure Tyler Allen’s other political aspirations or foibles are particularly relevant to the discussion at hand. I believe we need many more like him to question decision-making and develop alternative ideas for the public to consider. His primary run couldn’t be MORE relevant to the question of why 8664 failed, since he couldn’t even sell his candidacy to the 11K+ people who supported 8664 (He only received 7,851 votes, or 9.48% of the total, in the primary). 8664 wasn’t suspended, but was effectively finished when Allen left in 2009 to run for mayor in 2010 despite having limited political experience (as 8664’s founder) and no real political agenda other than, of course, 8664. According to the timeline of this article, regarding the ORBP “things got moving quickly two years ago, once a plan was introduced to fund the bridges with tolls.” That’s 2011, a year after the mayoral race. So that begs the question: why did Allen run for mayor in a heavily-crowded primary without either expanding his political platform beyond one idea (ie. 8664)? Why, then, in a city where registered Democrats outnumber Republicans 2-1, did Allen throw his support behind Hal Heiner, who never opposed the ORBP? (source: http://leoweekly.com/news/jerrys-kids-34). These are legitimate questions regarding the ultimate failure of both 8664 and Allen’s political aspirations, and this article doesn’t address them in the slightest. I see your point, Joel. I suppose I’m more concerned not with Mr. Allen’s failed efforts, but with why the community or elected leaders did not more fully embrace this possibility. Are you saying someone other than Allen might have succeeded, or are you opposed to 8664 altogether? The suburban commuters the Downtown Crossing bridge was built for don't seem to appreciate it that much. Traffic cameras show the costly new bridge nearly empty at rush hour.